Simple ingredients can often produce the most delicious food. 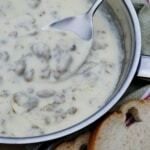 A good quality sausage, some flour, milk, salt and pepper can be transformed in just a few minute’s time into a fabulous sausage gravy, which frankly I enjoy for not only breakfast, but brunch and dinner as well. I first learned how to make gravy at about eight years old from my mom. It was one of my favorite things and is still to this day. Most of the time, we didn’t have actual meat in ours and she just used reserved bacon drippings collected over time. 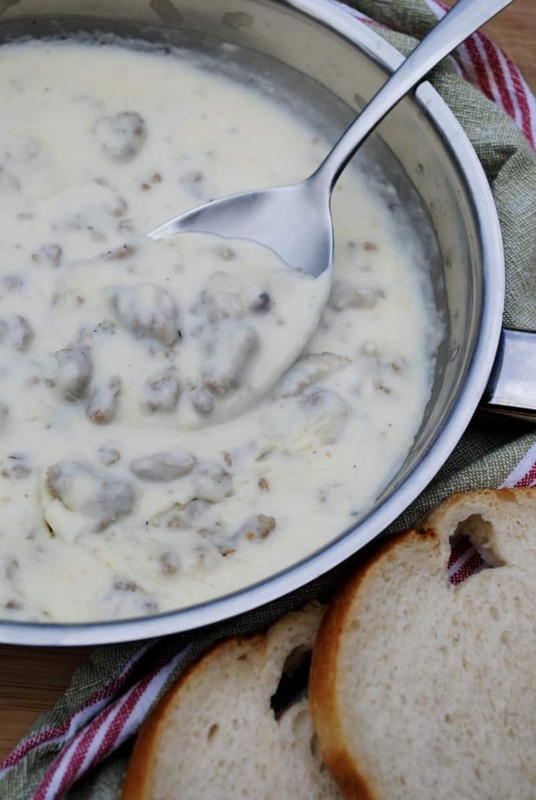 I still cook it like that when I’m short on sausage or the budget doesn’t allow for a sausage splurge, but my favorite gravy is the ever beloved sausage gravy. The secret to a good sausage gravy for great flavor and no lumps is to make sure you have a good flour to fat ratio and to let your flour brown. If you have too much flour, according to your fat, you may end up with lumps. If you don’t let your flour brown adequately and don’t season it well, you will have bland tasteless gravy. Don’t be afraid to add a smidge more fat if needed and don’t be afraid to use that tongue to taste test and make sure your seasonings are spot on. Other than that, it’s pretty straight forward and a quick and easy meal. Here’s a little video tutorial for you. Add flour and stir. You may add more fat or flour if needed. Slowly whisk in your milk. Raise heat a bit and bring to a soft bubble. If gravy gets too thick, add a bit more milk.